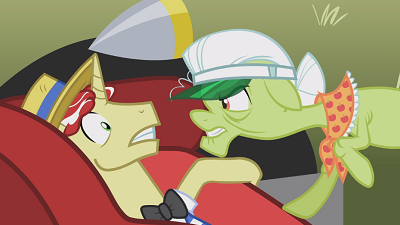 In which The Flim Flam Brothers, Flim and Flam, flimflam their way into the Ponyville cider market and attempt to drive Sweet Apple Acres out of business. The Industrial Revolution comes to Ponyville… and quietly departs with hat in hand. Once upon a time, around 1870, there was a guy named John Henry. Now, back then, they dug tunnels by drilling long holes into a wall, packing them with explosives, and blowing them up. John Henry was the best steel drill driver on his team, in his company, and maybe the world. One day, the company brought in a steam-powered hammer, a machine that could do the same job in less time. John Henry said that it couldn’t be faster than him, so they had a race. For a whole day, John Henry and the steam hammer drilled into the mountain. At the end, they measured the bores, and John Henry had indeed drilled further. But he had worked so hard and so long that he collapsed and died from exhaustion. He beat the machine, but he lost in the end. No one else could drive steel like he could, and the steam hammer took over. That’s the basic theme of the Industrial Revolution. Manual labor of all sorts became automated, and a global economy that was very local and agriculture-oriented became regional and manufacturing-oriented. With centralization of production, you didn’t need to spin the thread to sew your own shirts, you could just buy a mass-produced shirt off of a shelf that had been sewn together a hundred or a thousand miles away. Cider season is an annual event in Ponyville. Sweet Apple Acres produces the absolute best cider anywhere ever, but it’s a very labor intensive process. Manual collection of apples, sorting the good apples from the bad, producing the cider itself, all of it is done by hoof. As such, the Apple Family can only produce so much at a time, and their supply is vastly outstripped by the Ponyville demand for excellent cider. A pair of perspicacious ponies named Flim and Flam observe an opportunity for profit, and steam into town with their steam hammer Super Speedy Cider Squeezy 6000, a machine that produces cider three times faster than the Apple Family can. Worse, it’s really good. It’s not Sweet Apple Acres good, but Granny Smith likes it. The Flim and Flam Brothers make a generous offer to rent the SSCS6000 to the Apple Family for a mere 75% of the revenue, but that rate would ruin Sweet Apple Acres. Apple Bloom is on board, but Applejack shuts it down. At that rate, they would need to sell four times as much cider to earn the same amount of money, and the machine only produces cider at three times the rate. The Apple Family just can’t afford the deal, and so decline. Flim and Flam then swear to drive Sweet Apple Acres out of business. They return the next day just as the Sweet Apple Acres cider sells out with several barrels of cider in tow. Cider, I add, that was made with Sweet Apple Acres apples. 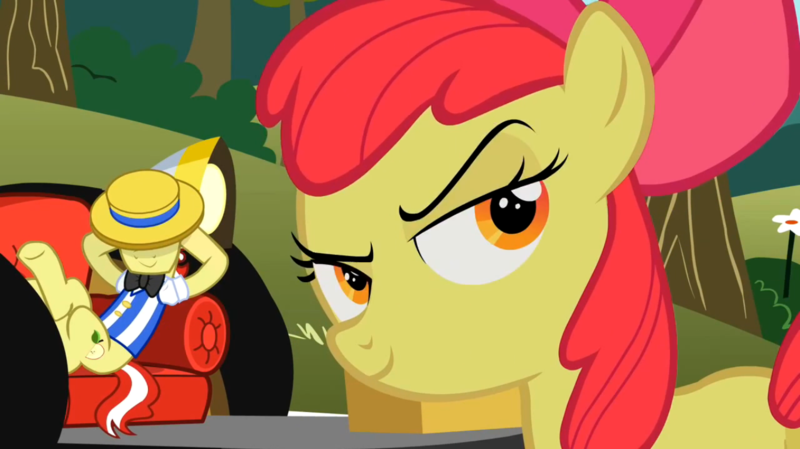 Apple Bloom starts upping the ante against the Brothers, making claims that she can’t back. When the Brothers call her on it, they propose a bet. 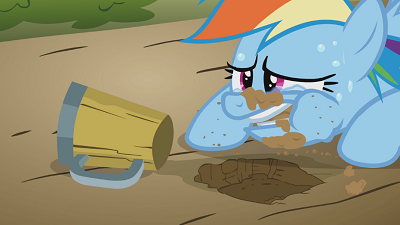 Whoever can make the most cider in one hour wins the rights to exclusive distribution in Ponyville. Granny Smith walks it back, calms everyone down… until Flim calls her chicken. Applejack knows they can’t win, not without sacrificing the quality of their cider. And for the first part of the contest, she’s right. They’re losing badly until Twilight Sparkle brings the rest of the Mane 6 in to give them a boost. They’re making cider at almost double the rate that Flim and Flam are before the Brothers start cutting corners on production. Disabling quality control vastly increases the rate at which they make the cider, but it’s literally made out of rocks and tree bark. Exclusive rights to cider distribution are worthless when your product is terrible. And so, the Flim Flam Brothers are run out of town for peddling poor wares, the quintupled output of Apple Family cider is enough to quench the thirst of all Ponyville, and Applejack writes to the Princess to declare that she learned… nothing! She was right all along. Which is mostly accurate. They pressed significantly more cider than they otherwise would have by doubling the size of their workforce, which I sincerely hope they continue in the future. Who knows? With the increased profits from filling the demand for their cider, they should be able to afford extra help. All told, a fun episode. The “quality beats quantity” aesop kinda bothers me, because capitalism doesn’t work like that, but it’s a children’s show. 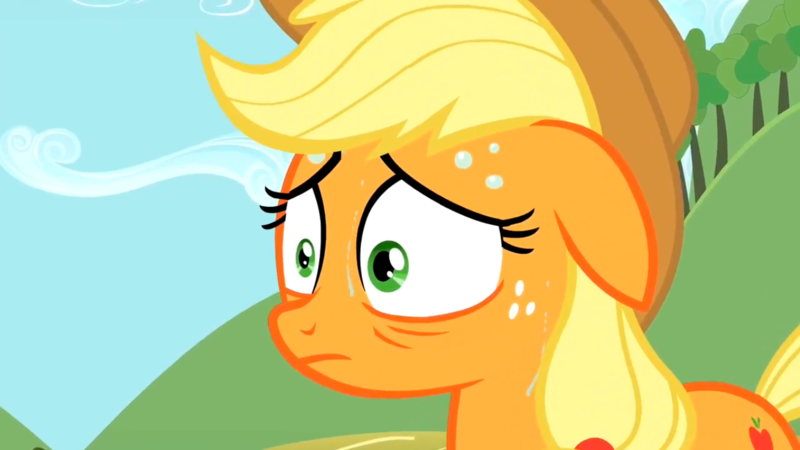 Even if Applejack already knew it, that’s an important lesson for young viewers. This episode has a bit of oddity going on with it thematically. The plot shares an awful lot in common with several American folk legends (Weston mentioned John Henry, the other main one that comes to mind is Paul Bunyan), all centering around the anxiety over the industrial revolution and the clashing of the American ideal of self-determination and hard work coming head to head with the concept of the machines slowly but surely taking over the industries. Those folklores tend to have similar endings – larger than life figures committing massive feats of strength to prove the superiority of man over machine, only to either fall just short of the results the machines could produce, or to win, but at massive personal cost, signifying the inevitability of the industrial age coming into its own and the ending of the previous era. This episode, on the other hand, has a similar struggle at its core for its plot, but while the former stories are much more about the fear of progress challenging portions of a nation’s identity, the lesson in this story is more about integrity and being able to rely on your friends for help when faced with a problem that you can’t handle alone, and therefore the ending is basically the polar opposite of the tales it’s sourcing as inspiration. The machine-runners win due to the sheer output capabilities of their contraption, but it doesn’t actually matter because the quality of what they create takes such a massive dip to compensate, and so for what it matters in the end, they lose. 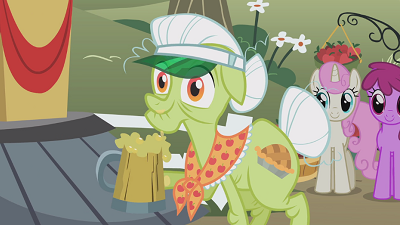 The fact that the cider that Flim and Flam produce is at least of passable quality at first (at least, enough to satisfy Granny Smith, who then quickly attempts to hide her reaction), makes this less of a lesson of “ponies outperform machines” or vice versa so much as it winds up being about Flim and Flam being ruthless profiteers willing to compromise their product if it means being able to drive their competitors out of business. In that way, the story is one about that kind of integrity, as the two’s lack thereof is ultimately their downfall, but on the flip side there is the Apple Family admitting that they need to take on help to meet the kind of output they need to compete (and to meet the demands of Ponyville on top of it). This may sound a bit familiar, and so it’s very fitting that Applejack pretty much already knew the lesson at hand, because, well, she’s been through this song and dance before. Speaking of the single best thing about this episode, oh my god that song. It completely makes the episode what it is, and I absolutely adore it. 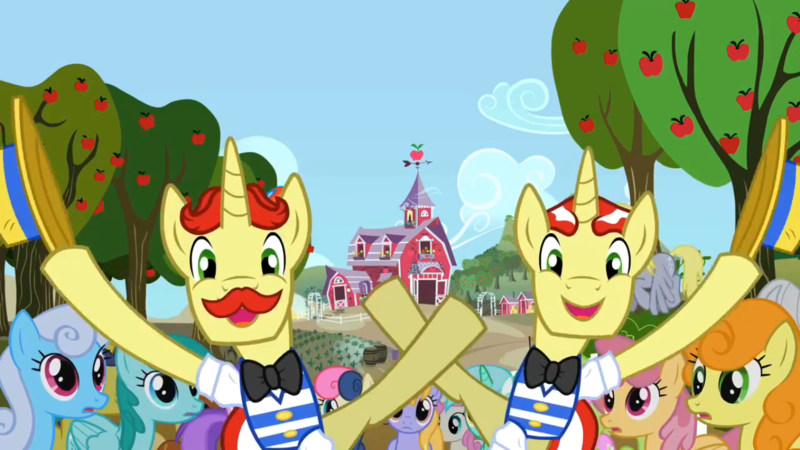 Flim and Flam in full-on Vaudville outfits put on a performance very reminiscent of The Music Man, and while MLP as a series is stuffed full of songs, this is one of the relatively few full-on musical numbers with full crowd participation. The two brothers are entertaining and amusingly designed enough even without it, but the song is what makes them such memorable characters. I really love getting to see the dynamic of the Apple family as a unit at work, and the differences in how they approach the problem the brothers present, as they aren’t in lock step over it. 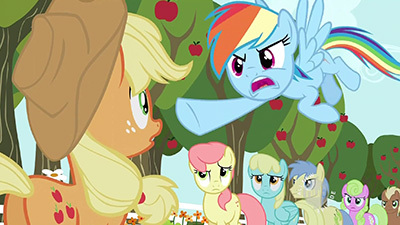 Apple Bloom immediately likes the idea of allowing the two to make their machine part of Sweet Apple Acres work force, while Granny Smith is steadfastly against it, leaving AJ sort of in the middle, not immediately opposed but skeptical of what the brothers will ask for in compensation (Big Macintosh unsurprisingly doesn’t have much to say on the matter). Then, once things turn sour, Apple Bloom is the hot-headed extreme optimist, with so much faith in her family that she’s eager and ready to throw everything on the line in their names, while Granny Smith attempts to be the voice of reason bringing everypony back down to earth… right up until her own pride is called into question and then she’s right alongside Apple Bloom, leaving Applejack sweating bullets as she realizes the size of the hole that her family is digging themselves into. The types of reactions each give all make sense given their respective ages and roles within the family (if maybe just a touch tropey because of that), and it gives the overall family much more character than if all of them were of the same mindset over the whole thing. Back in the good ol’ days when Black Friday actually started on a Friday, a couple buddies and I would make like the Ponyvillians and “camp out” in front of a store (Best Buy for us) to be first in line for opening. I use quotes here because it wasn’t so much camping as it was sitting in folding chairs, covered in blankets and coats and hats, all huddled around a little folding table with several carafes of coffee and bags of pretzel rods. The night and morning consisted of freezing our tails off, reminiscing about our high school and college days, and invariably bringing up text-console Pac-Pan; in other words, lots of fun (but cold) memories. Best Buy would open up at 5:00 AM, but the folks who did camp out in tents packed all those away by 4:00 and by 4:30 the line that stretched from the front doors as far as the eye could see would compress into a seething blob “just” three storefronts long. The doors would finally open and everyone would barge in to snag the Black Friday deals, but to be honest that was actually my least favorite part of the whole endeavor (though I did manage to pick up a few items over the years that have served me well). Then afterward we would head to a local 24-7 diner called My Friends to give our breakfast orders (usually of omelettes) to the sweetest old waitress I’ve ever met. Good times. I guess I bring this up because a part of me kind of wishes I could see what the camp-out was like for the Ponyville residents: was it about hanging out with friends for an admittedly silly purpose? Or was it all about the cider? The reason I bring this up is because capitalism makes us behave in very strange ways. Cider Season is a wonderful time to gather and support the local farm with money and smiles, but it’s also a tense battle of supply against demand in which everypony knows quite well that demand is going to win out… and yet they still get angry and indignant when it does. Is it really the Apple Family’s fault that they can’t keep up with the demand, or is it the town’s fault for expecting too much and getting all huffy when their expectations aren’t met? Is the Apple Family under some kind of obligation to expand their business to meet said supply when that strategy doesn’t seem to align with their core (thinly-veiled pun alert) values? 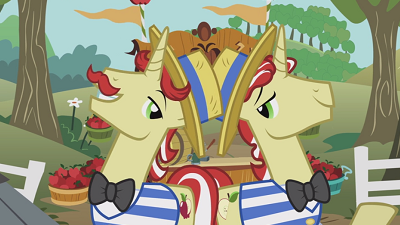 Is the town right to so quickly turn to the newcomer Flim Flam Brothers when they promise to meet their demand, when for years they’ve always trusted the Apple Family? I don’t think any of those questions has a clear-cut answer, as it all comes down to one’s own values and personal take on the situation. And this is why I’ve always seen this episode as more about the idiosyncrasies of capitalism than anything related to the Industrial Revolution: how one should weigh capital opportunity against values like friendship and honesty is rarely an easy thing to discuss in any meaningful way, especially to a younger audience. Watching these balancing acts play out through our favorite pony heroines (and less favorite pony capitalists with an annoyingly catchy song) helps anchor the otherwise nebulous calculus to actual emotions and actual consequences. I mean, we go from a startup challenging a monopoly to what is more or less a hostile takeover in under twenty minutes, all the result of aggressive entrepreneurs butting heads with strong tradition and townsfolk who, as per usual, can be convinced into thinking anypony is the greatest thing since sliced bread at the drop of a hat (or in this case, at the pressing of an apple into sweet, sweet cider). Heck, Applejack even accepts Twilight’s offer for help. Dang. Either she actually learned a thing or two from Applebuck Season, or capitalism is truly making her do strange things. Or both. While Flim and Flam’s cutthroat capitalism can be the fastest way to make a buck, the Apple Family’s version of capitalism tends to lead to images like the one above. Sadly, it seems all too often that this friendlier kind of capitalism gets mowed down by those who value capital over all else, but I guess that’s just the kind of society we live in. And Ponyville, so it seems. 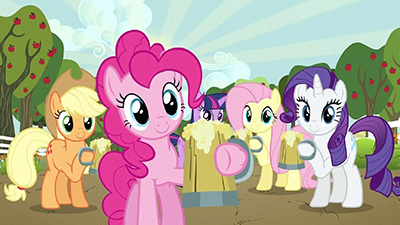 Also, good on Pinkie for sharing her cider with Dashie. That pegasus would have gone into withdrawal otherwise. While Super Speedy Cider Squeezy 6000 never really made it into my list of favorite songs, it’s hard to argue that it’s not toe-tappin’ catchy! So, have a remix: The Flim Flam Brothers (Locomotion Mix) by Eurobeat Brony ft. Odyssey & Rina. And now I’m thirsty. Amused that I ended last week’s post complaining about the portrayal of Pinkie as someone who hordes snacks for herself instead of wanting to spread the enjoyment, and lo and behold, that’s the inciting conflict of this episode. 🙂 Seriously, how many problems would be spared if they limited customers to 1 mug per purchase, and if you wanted more, you needed to cycle to the back of the line instead of just walking off with enough for a dozen people. And maybe let a person’s place in line carry over to the next day. If they’re selling for multiple days, they’ve got more than enough for everyone, they just need a little more structure to their distribution. I really enjoyed the episode. The melding of themes and ultimate lessons were a little wobbly, but not enough to throw the episode off, and it was a fun setup, was great seeing the rest of the Mane 5 find perfect ways for each of them to help out, the Flim Flams are a delight, and this my favorite song of the series so far. Such a magnificent sequence!